President Koo-Woun Park Lee of KEPCO E&C (left) and UNIST President Mooyoung Jung (right) are posing for a portrait at the signing ceremony for cooperation MOU. 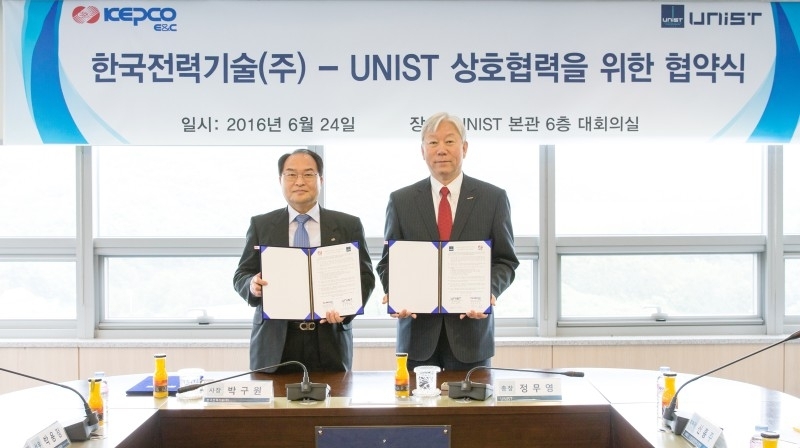 On June 24, UNIST signed a Memorandum of Understanding (MoU) with Korea Electric Power Corporation Engineering & Construction Company (KEPCO E&C) to collaborate on and support nuclear energy research and development in areas of nuclear research and policy. The primary purpose of this agreement is to address key technical issues associated with designing, building and operating next-generation nuclear energy systems to further advance nuclear technology to meet future energy needs. In the memorandum of understanding, the two institutes also agreed to advance nuclear energy research and infrastructure enhancements, all in the hopes of enhancing South Korea’s nuclear energy research capabilities. They also plan on cultivating high qualified nuclear power professionals. Founded in 1975, KEPCO E&C is a nuclear power design and engineering company in South Korea. The company engages in designing, engineering, and constructing nuclear and fossil power plants. Based on the generated output, nearly 60% of all Korea’s power plants have been designed by KEPCO E&C.